Justin Bieber in the Studio with Kanye + Bieber surprised cos Kanye never use phone! On Tuesday night Kanye West took to his Twitter account to post a photo of him and Justin Bieber while in the studio— working together on a track. 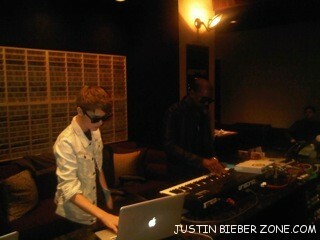 Justin Bieber is wearing sunglasses and a white denim jacket, and can be seen working on a MacBook, while Kanye West (also in sunglasses) is tapping away on a keyboard. Of course, he added that West certainly has his quirks. It’s amazing how stupid Justin is. If you NEED your phone you NEED a life. Ok, he never said he needed his phone, he’s just saying that he thinks its weird that Kanye doesn’t use one. Judgmental much. It is just as bad if you think others need a phone. Here is the thing people did get in contact with other people without phones. They talked to them, and since Kanye has a computer then they can just wait for him to get on and check his email. Yeah but all he is saying that it is easier to get in contact through phones. Yeah maybe they can get through to him through thye computer but i agree that it is easier using a phone coz you can get through to them within 30 seconds or something but a computer , if your not on it you might not get through to them for a couple of hours. His statment. No one needs a phone to do anything when email is just as good and if email is his only way of communicating besides talking then he probably has a computer near by at all times. Also talking in person is always the best way to communicate. I now love Kanye for managing without a phone and not becoming and addict like Justin already is. Tbh Brandy i’m not bothered it what Justin thinks, you put a lot of nasty comments on this website don’t you :/ your probs a nice person but i don’t really like you because of what you say. Just saying i don’t want and argument. The title to this article is horrible, you can’t write, and you all will end up ho’s when you grow up because u’ll sleep with all long haired females. you should take your address off, thats not a good idea to post it online. and this is mainly a fan site so i dout he’ll see it here, try twitter. Honey you should really remove your address.